Training for SAR is a major commitment of time, training a dog for SAR is an even greater commitment. MARK9 holds a team training twice weekly (currently on Thursday nights and Saturdays) usually in locations in the Northeast suburbs of Boston in area bounded by routes 2, 495, 128, and 9. Team members who are preparing a dog for certification typically train on at least one to two other days per week. Training occurs in the day, at night, and in all weathers. 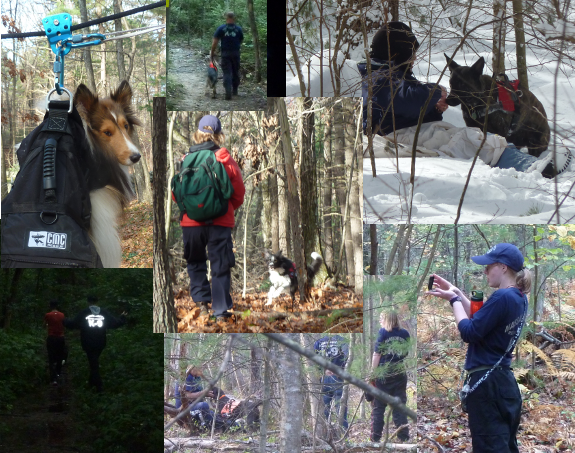 MARK9 training is intended to prepare its members as both ground searchers and as SAR canine handlers. Training includes preparing handlers and their canines for certification under the MASSARD Federation standards. Training focuses on ground search skills, lost person behavior, land navigation, and SAR canine handling skills. MARK9 members are also encouraged to seek additional external training in land navigation, ground search, search management, and emergency medical care.